What has never impressed me about hotels (even my preferred chain, Marriott) is the lack of multimedia support as a general rule: Usually you get a sizeable TV which has been neutered to only show hotel-provided TV with no external inputs for a personal DVD player, video iPod or laptop and a special protector on the cable’s input to prevent “rewiring” attempts by people like me. I suppose the original theory was to encourage sales of their pay-per-view movies but it always struck me as presumptuous that they would dictate my media consumption that way, especially as media continues to fragment into more of a “long tail” distribution. The newly remodeled San Mateo Marriott has shown me the future and it is much more friendly to today’s increasingly digital guests. The guest rooms have a flat panel TV (a less unique feature these days) that has more importantly been wired to a multimedia input panel built right into the desk along with a high speed data line and not one, not two, but FOUR power outlets. Good job Marriott! 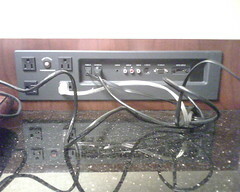 If all hotels did this I could stop travelling with little power strips for all my laptops, phones, etc. and I could watch some episodes of “24” that I’ve downloaded (legally, mind you) to my DishPlayer Archos multimedia device. I hope this is a sign of things to come to other properties at Marriott and other hotel brands in the future.